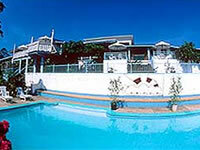 The San Ignacio Resort Hotel is the full-service resort property in the town of San Ignacio. It is located about 75 miles west of Belize City in the heart of the Cayo District. Situated above the lush Macal River Valley, the resort boasts incredible views of rainforest and wildlife from all of its deluxe air-conditioned rooms. The Hotel San Ignacio offers on-site activities including a system of nature trails that leisurely wind through our private 14-acre jungle preserve and riverside beach. These trails offer easy access to more than 100 species of plants and trees and 70 species of birds, as well as other wildlife including gibnut, agouti, armadillo and the endangered green iguana. All 24 rooms at the Hotel San Ignacio wrap you in four-star comfort and feature grand entryways, private tiled baths, cable television, telephone, and Internet connection. A few room offer their own secluded balcony. The hotel also has a nice and refreshing pool with the jungle view! The Hotel San Ignacio is a conveniently situated hotel for visitors that wish to visit the various scenic attraction of the Cayo District and Pine Ridge area. Tours to such major Mayan archeological sites as Cahal Pech, Xunantunich, El Pilar, Caracol can be easily arranged for. Other activities include canoeing, caving, bird watching, and horseback riding and even visiting San Ignacio's own Farmer's Market.